This portable wet dry vacuum cleaner is compact and lightweight making it easy to carry and store. This small shop vacuum is ideal for quick pick-ups around the house, dorm, apartment, or condo. Upright vacuums can't handle every job, and most are certainly not portable vacuum cleaners. This wet dry vacuum can handle those jobs without taking up precious space. Compact and lightweight wet dry vacuum is easily transportable. Stable, flat-bottom design prevents the shop vacuum cleaner from tipping. 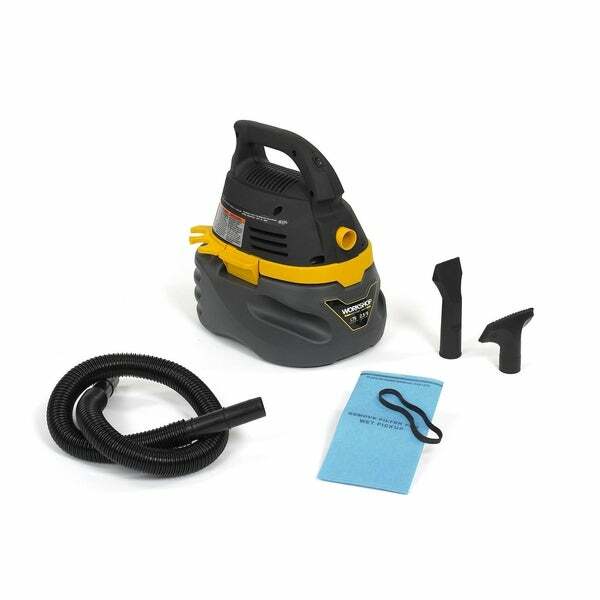 All wet dry vac attachments store on board. Shop vacuum stores easily in a cabinet or pantry. Integrated blower port for added versatility. Dimensions 14.0 In. X 11.0 In. X 15.0 In. This is a powerful shop vac for the price! I like that it is very lightweight which makes it portable. It is a perfect size for a condo or apartment where storage may be limited. Love this vacuum. Small enough to be easy to carry and enough power to do everything I need it to do. This item is a great addition for cleaning up with. My wife wanted something small and portable to use in our travel trailer. I take it with us every time we go camping. Picks up small rocks etc. we have two little dogs that bring in sand and dirt on their feet and this does a great job. She also uses it at home to vac out cars. Would recommend this to anyone. This is a great compact easy to use shop vac. I needed a small one because I would be storing it in a work bench and didn't want it to take up too much space. Powerful for a smaller unit. this is a good shop vac. my indoor vac. a dyson, died and i did n't have money for a regular vac. I will say it encouraged me to take care of the cobwebs. I does a good job for something made for a shop. Works great so far, after a week of steady use. I am disappointed, the suction is not great. I expected a stronger suction. Only 1 dasw back the cord. i hope 1 day it will come cordless. "Is it good have suction and pick up material such as sand and gravel"
"Canyou plug it into car battery"
"Is it bagless? How do you dispose the dirt and clean inside?" Hello hidekisuzuki, this shop vacuum is bag-less. Once the canister is full you just remove the top and tip it over into your garbage can. Thanks for shopping with us!